just a tiny bit of too much braking into the corner and the front was gone. the black mark in the middle of the street is from my blocked tire, ther were other marks to, probably from other bikes crashing . next to the road was a ditch (unvissible on the picture). 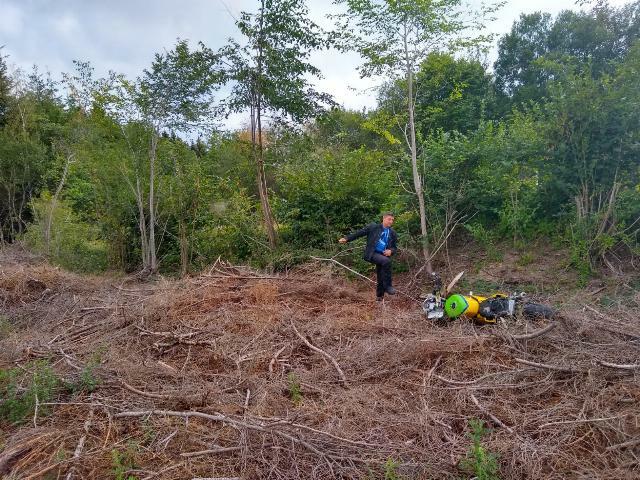 me and my bike slid into it and it launched us both between the 2 slanting small trees. When I was rolling/flying through the bushes I thought to myself : "Wow, my bike is high in the air" as I saw it flying for a brief moment . when I first got up (nothing serious, just a bit of pain in my back the day after) I couldn't find it. We had landed in what looks like a chopped bush where all the big parts of the trees already where removed and only the small parts remained. My bike was 10m further from where I was (in total, it was about 50m from where the front tire gave up and 15-20m in the field). 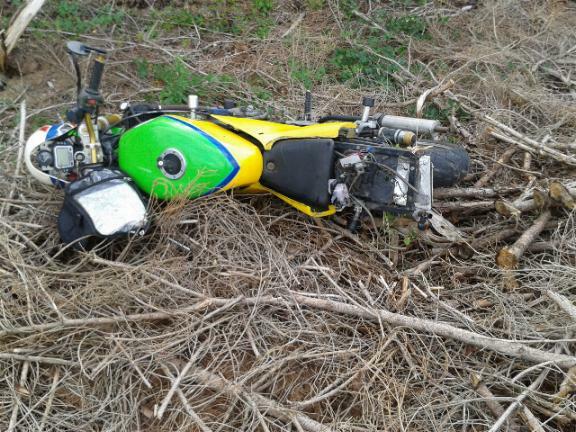 I seriously doubt the bike had slid to that point as there was no trail of marks from a sliding bike on the branches. my helmet (new from last year) only had some green dirt between the shell and the visor, it had touched nothing alse. on my leathers, there was only a big sliding mark on my upper leg, the upper-body didn't have a single mark. but the biggest surprise, my bike : because of all the branches, it was impossible to push it out, so I started it (first kick) and rode it out while my 2 mates also gave soem pushing. 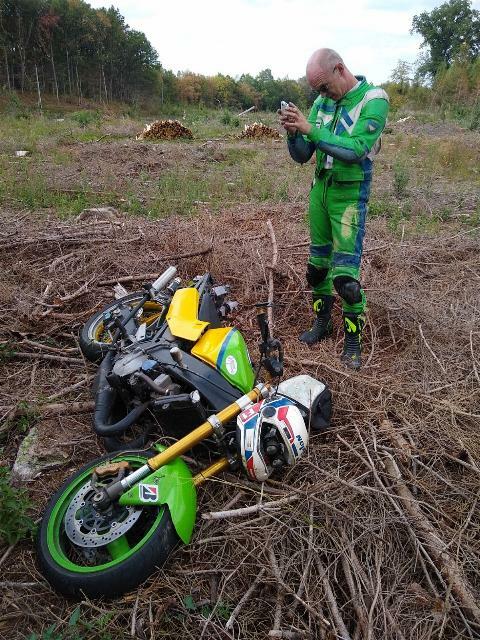 up front : as can be seen on the picture, I have a helmet upfront as a small fairing : it's visor was gone no other marks on the helmet, the right blinker damaged , left miror broken and the brake handle a little bend. that's it ! on the left side, I have 3 crash-bobbins : 2 up front, 1 at the rear to protect my exhust can : that bracked had broken, but not a scratch on the can itself. at the rear : the rear plastics broken in many pieces, taillight and blinkers gone, supporting brackets and locking mechanisme for the rear seat all broken/bend, and my license plate bend . It was "kind of" a special moment : my 25th crash/accident and the 10th with my beloved KR1S Somehow, there must be a very tiny bit of Marc Marquez inside of me, as I have never had any serious injury (biggest one was a hole in my elbow : I could see how the bones hinge in each other). I didn't misjudge the corner and only I only have the idiot who was in control to blame obviously, we were not cruising arround we estimated my speed must have been at least above 90 and probably above 100km/h. My wife is already used to it : all she texted back was "that happen's"
Jan glad to see you are OK. Bikes can always be fixed. Well done for finding such a safe place for your 10 th anniversary crash on the KR. Id agree!....glad your largely OK thou mate and your Mrs has my sympathy too! Must be all the practice that you are getting good at crashing. topic should have been in chit-chat. Last edited by JanBros on Sun Aug 12, 2018 2:29 pm, edited 1 time in total. I don't know whether others can see the latest pics, Jan, but I can't. back still hurts, was during 2 weeks of vacation, but I don't think I'll be back at work tomorrow or the entire week. will be winter-work. It was due a big overhaul anyway, best to do it properly and not rush things for a couple of months. still have the KR1-SV. Nasty crash, but it could have been a lot worse. Get a pretty blonde nurse to massage your back several times a day and you'll be up and running in no time at all. looks even lighter and faster now !! back bruised, stil not very flexible and hurts when trying. Well it is a project now anyway.